The war for New York’s soul escalates big time when Luke Cage and Iron Fist take on the all-new, all-different Power Man! Who is the kid that can mop the floor with them both? And if that wasn’t bad enough, the worst villains from Luke and Danny’s past are crawling out of the woodwork en masse to take them on: Cockroach Hamilton! Comanche! Specs! Senor Muerte! Discuss! Stiletto! Why has this flash mob of colorful criminality suddenly swarmed against our heroes — and what role does it play in the long-term schemes of The Hand? In a flashback we see what happened in one of the buildings that was blown up by Bullseye. It shows how our hero’s father died. In the present his mother discovers he’s not in his bed. Luke cage lands on a car as him and the new Powerman get into an argument about how Luke is a sellout. Him and Iron fist start to fight and a gangster he roughed up in issue one recognizes him and calls for his gang. A mysterious woman send in super villains. 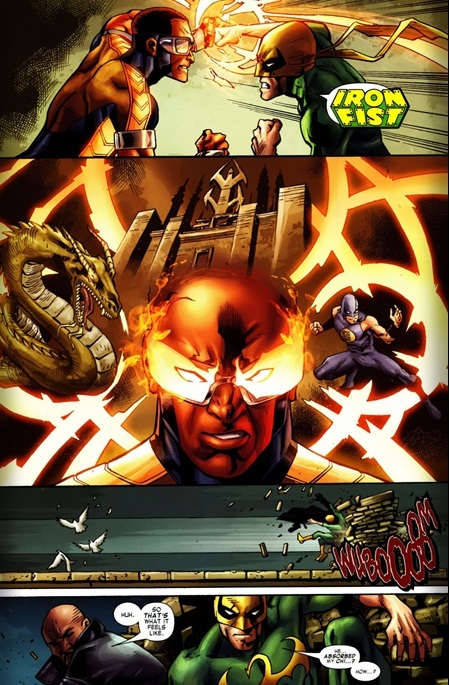 He manages to hold off both iron fist and Luke cage by absorbing the chi from the iron fist technique. That’s when the mob of old Luke cage villains attack. They rough him up as his powers are low. Rand and Luke save him and in the process get frozen on spot, he takes out that villain explains why he’s doing this and departs. Cage recognizes who’s son he is, an old gang friend from his youth and early days know as shades. Powerman is found by his friend who lives in the same house she helps him inside despite him being banged up and they share a brief flirtation. His mom comes in but the girl lies about what happened and saves him from her wrath. Elsewhere the mysteries woman is reveled as deadly nightshade an old Luke villain. She reveals the new Powerman has something his dad stole from her. 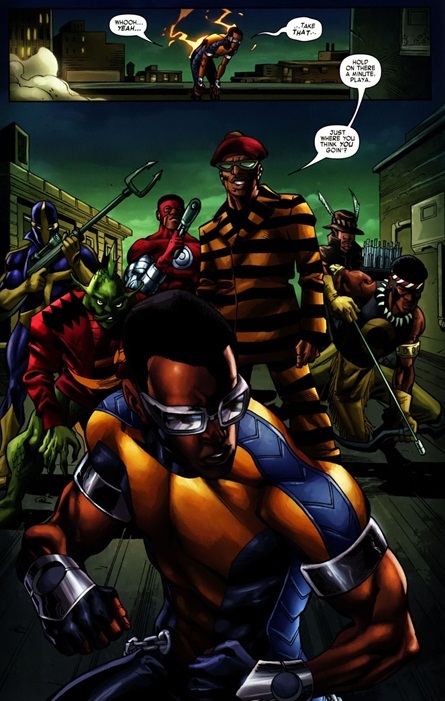 Old school readers of Luke cage Power man from way back in the day will love this issue as almost all of the old rogues gallery shows up here in one form or another. 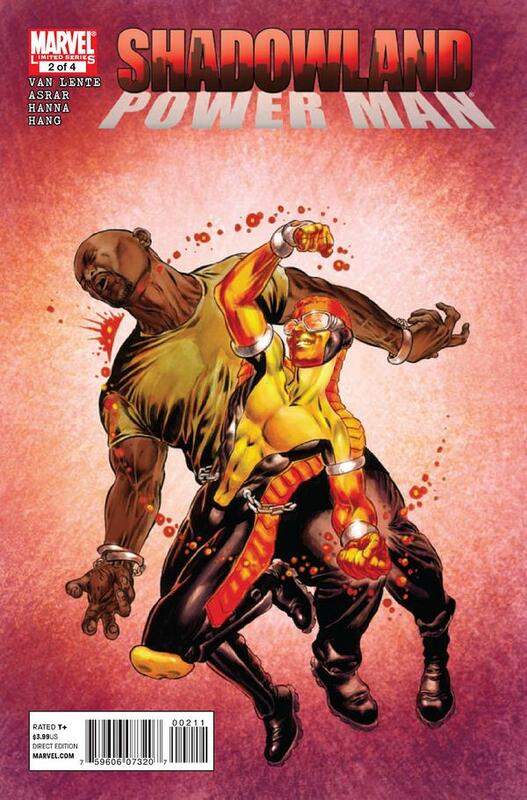 The new Powerman’s powers are revealed a little, he can absorb and re-channel chi even absorbing the brunt of the iron fist technique. His powers and past tie him neatly into the old Powerman and iron fist series mythology and brings everything together for this modern story. I enjoyed the art in this issue and the presentation of Iron Fist and Luke. If you never read old school Luke these villains are virtually unknowns not even F-list they are just Unknown.